On the occasion of the recent publication of The Complete Poems by Philip Larkin, as an inveterate shirker of responsibility I cannot honestly say I feel it is incumbent upon me to send a flare up alerting prospective readers to the virtues of Larkin’s somewhat overlooked pair of novels, but I’ll do it anyway. Larkin is known as something of a poet’s poet, heralded everywhere, but probably more often read in his native Britain than the United States. I like to think of his poems as cheerfully morose, or perhaps he is witty about his moroseness in such a way it cheers a certain kind of reader up, the kind I am for instance. The first novel of his I encountered was Jill. Normally I would flee from another British novel about Oxford, Cambridge or an English boarding school as if the Luftwaffe were on my tail. Yet this one about an insecure lad from rural England experiencing Oxford during the thick of the Second World War and inventing a girlfriend for the purpose of provoking envy and mystification among his Oxford mates offered unaccustomed promise. Whatever is not unique about the novel’s basic circumstances is compensated by the richness of the observation and the intimacy, honesty and intricacy of the rendering of the protagonist John Kemp’s maiden voyage into the domain of serious tradition and the casually highfalutin. The telling is down to earth, yet also carries the reader along with the same nearly ethnographic fascination of Kemp himself. The novel has many of the most desirable elements for an engaging read: class, decadence, hedonism, intellectualism, guilt, insecurity, lust, bombing runs and remarkable verisimilitude in time and place. It also shares a quality with Larkin’s second novel, which is hermetically sealing the reader within the setting, if one likes that sort of thing, which I, without ambivalence do. The second novel, A Girl in Winter, also is set in wartime England, its young eponymous protagonist leading a life of something like genteel poverty (strong whiffs of Gissing) swamped with feelings of acute displacement and isolation, though years back she spent a summer in England as an exchange student. A non-present personage from that visit plays a role in her current situation, what turns out to be a somewhat confounding preoccupation. 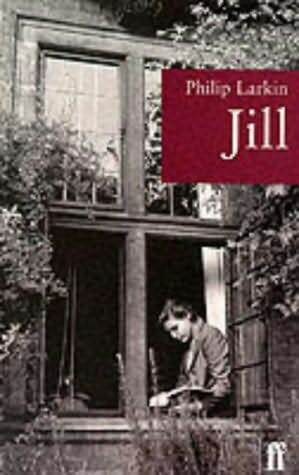 Like Jill, it is one of those novels that seem at first like a lot of others, but in the end is very much one of a kind. In both books this uniqueness in all likelihood has something to do with the meticulously poetic evocation of place, perhaps what one would expect from a renowned poet, though such is hardly always the case. As pedestrian a recommendation as it may be, scenes and images from A Girl in Winter recur remarkably often in my thoughts. The protagonist Katherine’s surroundings, in particular the peculiar, persnickety and dyspeptic staff in the library where she works lends her dislocation and alienation both an edge and a touch of the elegiac, and gives us something of a rooting interest. In the day to day circumstances of Katherine’s present as well as in the summer interregnum in the novel’s middle, the story has its own unique air of mystery. I would go so far as to say, if it has been unclear from my perambulations so far, I am a big fan of both books.